In automobiles, energy is conserved by means of being converted from one type of energy being to another -not energy being lost and then another type arising in a different form. For example gas being burned to power the cars movement occurs due to a change from chemical energy to kinetic energy. The basis for my project was to discover more about another way in which automobiles can conserve energy. Cars can have batteries inside that are charged by energy lost from going down hills, and that can utilize that energy later -for example, when the car is stopped at a red light, the battery will take over gasoline's role by powering the radio and such. Many car companies have recently used this type of conservation to utilize energy since it makes cars more fuel efficient by not having to burn as much gas -something that is quiet appealing to today's car buyers. Recently, Chevrolet has put batteries in their automobiles calling it the eAssist system (the e standing for electric). However, the idea was not original to General Motors Company but rather similar techniques have been used by Honda since the late 1990's. At the top of hills, objects have potential energy - and as they travel down, it's converted to kinetic energy. 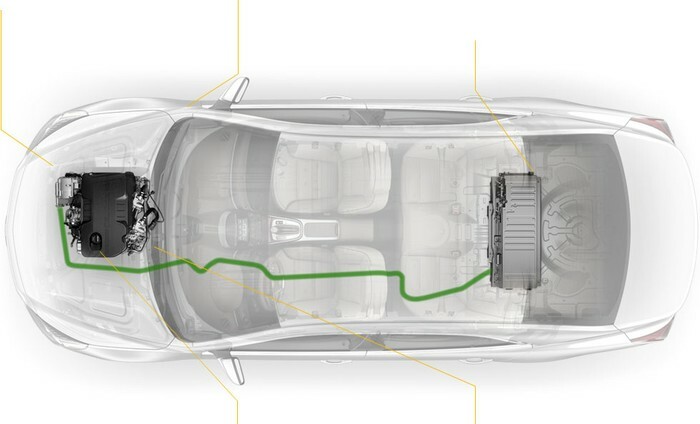 In cars with eAssist, going down hills is when the car captures energy and stores it in the battery. The cars have 15 volt batteries -and to charge the entire battery it takes 2.403265995e-18 N*m. In my smaller-scale experiment, I tested how much differing hill heights affects the amount of the battery charged. Since I used a .15 kg cart as opposed to a 1800 kg real car the difference between how much battery my cart would be able to charge is minuscule however. My setup was comprised of a ramp, .15 kg cart, uniform wooden blocks (to change height), and a motion detector placed at the bottom of the ramp. For each trial, I change the height by adding an approximately .04 m block under one end of the ramp, stacking one a new one each time. I used logger pro to analyze the data my motion detector had collected and took each final velocity. 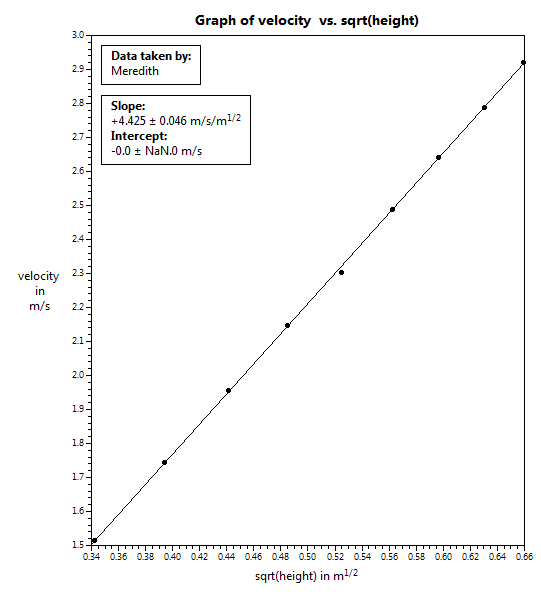 Then, I made a graph using the data I collected to show the relationship between the differing heights and the final velocity -or the kinetic energy that was created during the trial. As shown in figure A it was a linear relationship so that shows that the higher the incline, the higher kinetic energy which in turn would charge more of a battery. This makes sense because using the equation gh=1/2v^2 for a situation in which an object begins with potential and ends with kinetic energy such as in this experiment, with gravity staying the same at 9.8, the larger the height, the larger the other half of the equation meaning velocity should be. Next, after creating that graph I went on to make the one seen in figure B which was the theoretical graph of what should have happened. 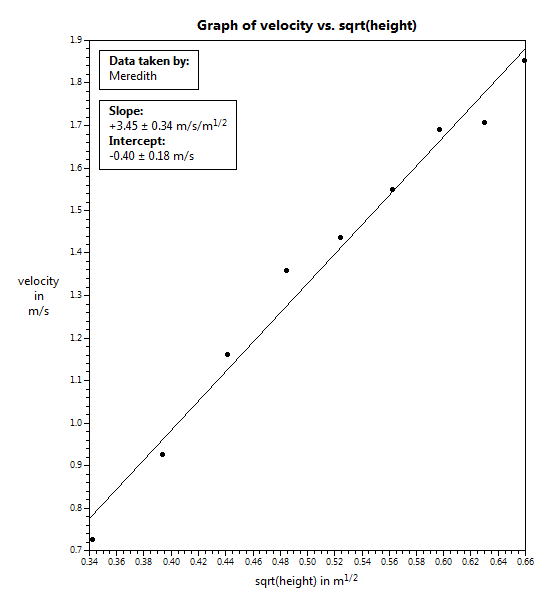 Therefore I used algebra to solve for v=sqrt(2gh) and plugged those velocity values into a linreg graph. Again, the relationship was linear, but more so that the experimental graph. 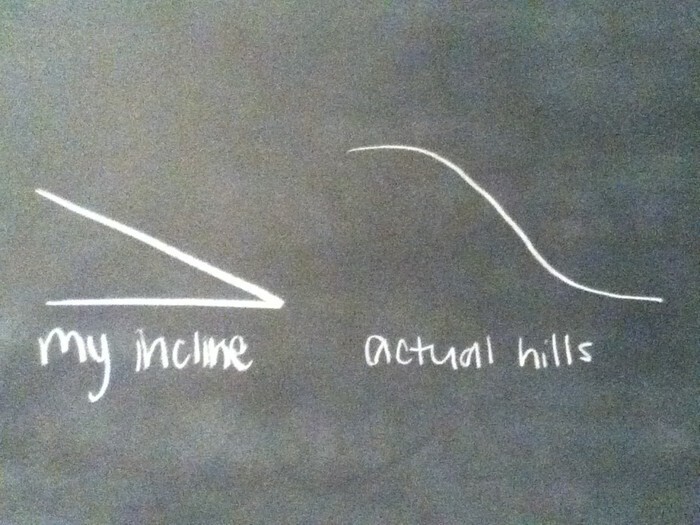 In addition, both my theoretical and experimental graphs were square root functions and were linearized. Reasons for the difference between the graphs include somewhat off final velocities from logger pro. However the graphs have the same trend so my data collection was correctly done. My means for stopping the cart was to just slam my hand down on it at the end of the ramp which could have led to minor misinformation from the detector. One problem with trying to create a smaller scale experiment was that a small cart is nothing like a large automobile. This experiment relied heavily on the use of hills -however, I used a ramp with a uniform slope which is truly similar to a hill that a car may travel on. This described difference is shown in the diagram figure C. Another thing that made the experiment somewhat faulty was the fact that when one drives on a steep hill, they use breaking to maintain a safer velocity whereas in my experiment it was assuming that cars just roll down hills uncontrollably. However, the experiment still was able to give a general idea of the physical laws behind this innovation in energy conservation for automobiles, and proved that the larger the incline, the larger the velocity and amount of a battery that could be charged.